Mormon Mommy Writers and Friends: MMW Anniversary Celebration- It's Giveaway Time! There has been a virtual whirlwind of e-mails flying around behind the scenes here at Mormon Mommy Writers over the last few weeks! And let me tell you, during the entire month of January these incredible ladies here at MMW are going to be HOOKING you UP! Now, let me say that since I’m new to the club I have very few connections to fabulous famous authors who can dash off free copies of their incredible books to your mailboxes. Okay I have NO connections to such authors. Sad, but true. Fortunately for me, these lovely MMWs are so well connected that they are generously allowing me to offer books from their contacts to you! I have been getting to know the work of these authors over the last couple of weeks and I am waaay excited to introduce them to you if you don’t know them already. Will I use the word “addicton” with some of these authors’ novels? Umm…yes, I think I might. While I’m not connected, I am crafty, and so I will be offering not only awesome books from great authors, but also some fun little handmade goodies for you and your home. Think girly accessories (there will be flowers involved)…because even while we’re slaving away at our computers, we still need to feel girly, right? This week I’m kicking things off with a little something to spruce up your home for the new year. I saw these book bundles featured at places like Pottery Barn and Restoration Hardware (you know, those fancy shmancy stores that we poor writers can’t afford?) and, as a reader and writer I just loved their warm rustic elegance. 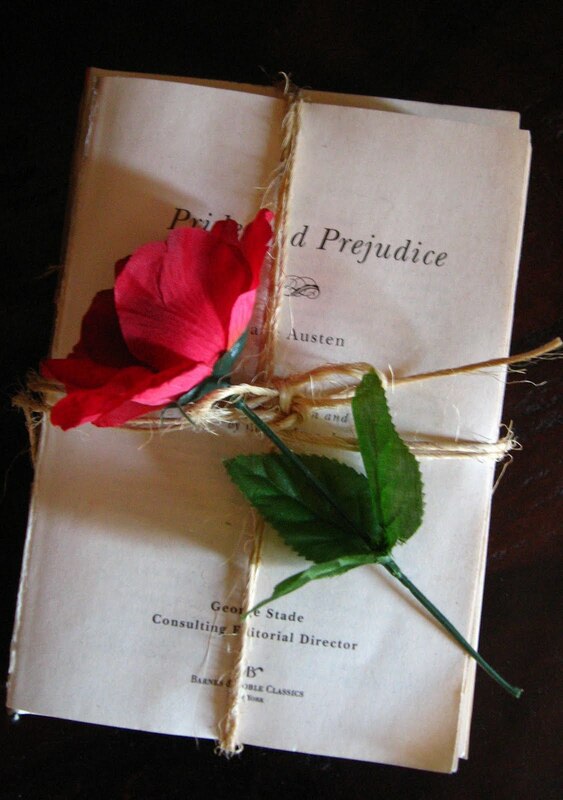 Today I am giving you the chance to win a very special Pride & Prejudice book bundle complete with a lovely red rose tucked in the top. Perfect for a Valentines Day decoration! And you can change out the rose to match the season- tulips for spring, autumn foliage for fall, a sprig of evergreen for Christmas. It's a lovely and versatile addition to your home or office decor! 1. You can earn an entry by being a follower or becoming a follower on our blog/facebook page. 2. You can earn an entry by advertising our blog/facebook page on your blog or facebook page. 3. You can earn an entry by commenting on your favorite past MMW posts. Please comment on this post and let me know how many entries you've earned. This giveaway closes at midnight tonight and the winner will be drawn at random and posted tomorrow! I'm right there with you. I want some of these prizes so bad. I am extremely jealous of our readers! I love prizes, so count me in. Count me in!! This would make a great gift for my daughter- Kacey. She loves Pride and Prejudice!! Don't forget to tell us what you have done to earn entries and how many entries you have!! Love the anniversary special! I wrote a brief spot about it on my blog, debraerfert@blogspot.com, and I'm already a follower. I have no pride when it comes to wanting a free book, and I'm very prejudice toward Mormon Mommy Writers. Yay! This is so exciting!! I am a subscriber to MMW, have posted a comment on the MMW article "Writing On the Road", and have "liked" MMW on my FB page (plus posted a referal to your site). I've also mentioned MMW on a post to my blog, http://notesfromtheguamside.blogspot.com, and working on getting a list of the blogs I follow actually posted on my blog page. Hope all of you at MMW are having a great start to the New Year! Lovely giveaway. I've never been to your blog before, so I browsed the sideline topics, and came across your "friendship" column, and found the cute post about the 80's party. What fun, and what cute photos. Love the idea of dressing up as your 80's. This is a fun and inspirational blog. I am following on Facebook and the blog. I also shared it on Facebook!! I have one entry, and I would love to win this! I have one entry by being a follower on Google Friend Connect. Love Pride and Prejudice! I earned two entries! Unfortunately there's way more than two prizes that I'd like to win!